Medical Detection Dogs is a UK Charity that trains dogs to help people with life threatening health conditions, giving them greater independence and above all saving their lives on a daily basis. Cancer and Bio-detection Dogs was formed in October 2007 and obtained charitable status in June 2008. In 2003 John Church brought together a team of doctors, dog trainers and scientists. In 2004 a preliminary proof of principle study was completed. This was published in the British Medical Journal (Willis CM, Church SM, Guest CM, Cook WA, McCarthy N, Bransbury A, Church MRT, Church JCT. Olfactory detection of human bladder cancer by dogs: proof of principle study. BMJ 2004 329: 712.) The study provided the first proof that dogs could identify a unique odour or ‘odour signature’ that was associated with cancer. This was the first clinically robust trial to be completed and published in the world. Can the Power of Scent be used to Detect Cancer? A new study from Germany, reported in Aug 2011 European Respiratory Journal, has found that sniffer dogs can help physicians make early yet reliable detections of lung cancer in patients. The test involved 50 healthy people and 25 patients with confirmed cases of lung cancer and another 50 with chronic obstructive pulmonary disorder (COPD). The patients ranged across the stages from I to IV. Test went in phases in which the dogs, all household pets, were first trained then introduced to samples for training. After they were trained to lie down & sniff the samples the real test was administered. The dogs showed 71% success rate in detecting lung cancer, with the stage of the cancer having little effect on the success rate. Researches acknowledge that dogs are limited and cannot convey what kind of cancer they are detecting, but the research does hold promise of the development of electronic tests that can identify maker chemicals in the patient’s breath. Figuring out what those markers are is the next step. More research is needed to determine what compounds the dogs have been detecting. Previous studies have shown that dogs, with then sharp sense of smell, can identify patients with certain types of cancer especially lung and colon cancers. Dog owner's best friend detects cancer & saves her life! 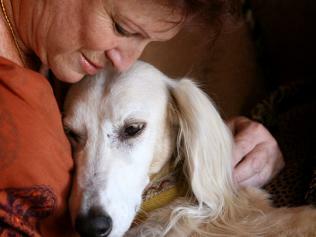 Paula Bockman-Chato had first believed that the constant sniffing and nuzzling under her arm by her beloved saluki Kaspar was just the dog being affectionate. But that was until a medical check revealed early signs of lymph node cancer in the very spot that had attracted Kaspar's attention. While Mrs Bockman-Chato's story is remarkable, it is not uncommon. Scientific research has now confirmed what was long anecdotally believed - dogs are highly successful in sniffing out cancer in humans thanks to their incredible sense of smell. So good are they that one of Australia's chief vets is pushing to have dogs in GP surgeries just to sniff out cancer. Australian National Kennel Council vet Dr Peter Higgins said it was time doctors used this remarkable ability by having dogs in their surgeries as early cancer detectors. "It would not replace diagnostic tests but it would be a good early and non-invasive way of finding if something is there," he said. "They went to their doctor and found they had a skin cancer developing." Dogs may have the ability to detect certain types of cancer by smell. Specially trained dogs can detect certain proteins occurring in cancer patients’ breath. Studies undertaken in UK, USA & Canada took a large group of people, half with a certain type of cancer and half without to conduct the tests. Dogs were trained to signal by sitting or lying down when they smell a person’s breath who they suspect has cancer. 97% of cases were successfully reconfirmed by the dogs. “Dogs not only have a hardworking and loyal temperament, but an incredibly strong sense of smell. It’s astonishing to know that their assistance in the world of science could potentially help to save the lives of cancer patients.” Dr Higgins. Anecdotal evidence of dogs having this ability has been rumoured by dog owners for decades. In the past, people have sought medical advice because their pet dog has taken an unusual interest in a particular mole on their skin, or provided signs to compel owners to visit the doctor to check. Current conventional screening tests vary between types of cancers and include biopsies, physical examinations, and blood tests. “This represents a less invasive form of detection, and a quick and efficient way of helping to confirm early detection of cancer. Conventional tests aren’t always 100% accurate, so this provides another means of confirming test results to allow greater scope for early intervention.” Dr Higgins. Australian National Kennel Council (ANKC) looks forward to future research being undertaken in this area. “I hope to see this research develop in the future, and if this success continues, look to integrate it with current cancer testing methods. What is even more exciting is the possibility that dogs could detect some cancers that conventional methods cannot detect.” Dr Higgins. California's Pine Street Foundation found dogs identified people with lung and breast cancer by sniffing proteins in their breath. The foundation ran a trial involving 86 patients with cancer and 83 without and found dogs could identify the cancer patients with an 88-97% accuracy range. University of Oklahoma researcher Dr Patrick McCann, inspired by the dog cancer research, is developing a test using infrared lasers to detect cancer markers on a patient's breath. NB: There were no conflicts of interest for any study authors. All dogs were treated in a humane and safe manner, consistent with professional dog clicker training. None of the dogs were pets of any of the investigators, trainers, or handler. Ovarian cancer is the 5th leading cause of cancer death in women. Early diagnosis is the most important step toward reducing morbidity and mortality from ovarian cancer (e.g., from less than 10% in late stage cancer to greater than 90% survival rate for early detection). This innovative project will focus specifically on detecting ovarian cancer through analysis of exhaled breath, leading the way towards a truly non-invasive way to diagnose ovarian cancer. A major step forward in this study is that breath analysis will be conducted both with trained dogs at the Pine Street Foundation and with sophisticated analytical chemistry at laboratories in Maine. In all countries and jurisdictions, there are many topics in the politics and evidence that can influence the decision of a government, private sector business or other group to adopt a specific health policy regarding the financing structure. Thanks. UK Charity that trains dogs is doing great for the people. Highly energetic blog, I liked that a lot. Keep on posting! I must state, the blog compositions are ethereal.